What is a Coaxial Cable? Suppliers - Hangzhou Spring Electronics Co.,Ltd. Home / News / Industry News / What is a Coaxial Cable? Coaxial cable, or coax (pronounced /ˈkoʊ.æks/), is a type of cable that has an inner conductor surrounded by a tubular insulating layer, surrounded by a tubular conducting shield. Many coaxial cables also have an insulating outer sheath or jacket. The term coaxial comes from the inner conductor and the outer shield sharing a geometric axis. Coaxial cable was invented by English engineer and mathematician Oliver Heaviside, who patented the design in 1880. Coaxial cable differs from other shielded cable used for carrying lower-frequency signals, in that the dimensions of the cable are controlled to give a precise, constant conductor spacing, which is needed for it to function efficiently as a transmission line. Coaxial cable conducts electrical signal using an inner conductor (usually a solid copper, stranded copper or copper plated steel wire) surrounded by an insulating layer and all enclosed by a shield, typically one to four layers of woven metallic braid and metallic tape. The cable is protected by an outer insulating jacket. Normally, the shield is kept at ground potential and a signal carrying voltage is applied to the center conductor. The advantage of coaxial design is that electric and magnetic fields are restricted to the dielectric with little leakage outside the shield. Conversely, electric and magnetic fields outside the cable are largely kept from interfering with signals inside the cable. Larger diameter cables and cables with multiple shields have less leakage. This property makes coaxial cable a good choice for carrying weak signals that cannot tolerate interference from the environment or for stronger electrical signals that must not be allowed to radiate or couple into adjacent structures or circuits. 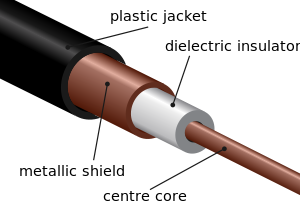 Common applications of coaxial cable include video and CATV distribution, RF and microwave transmission, and computer and instrumentation data connections. The characteristic impedance of the cable is determined by the dielectric constant of the inner insulator and the radii of the inner and outer conductors. A controlled cable characteristic impedance is important because the source and load impedance should be matched to ensure maximum power transfer and minimum standing wave ratio. Other important properties of coaxial cable include attenuation as a function of frequency, voltage handling capability, and shield quality. Coaxial cable design choices affect physical size, frequency performance, attenuation, power handling capabilities, flexibility, strength, and cost. The inner conductor might be solid or stranded; stranded is more flexible. To get better high-frequency performance, the inner conductor may be silver-plated. Copper-plated steel wire is often used as an inner conductor for cable used in the cable TV industry. The insulator surrounding the inner conductor may be solid plastic, a foam plastic, or air with spacers supporting the inner wire. The properties of dielectric control some electrical properties of the cable. A common choice is a solid polyethylene (PE) insulator, used in lower-loss cables. Solid Teflon (PTFE) is also used as an insulator. Some coaxial lines use air (or some other gas) and have spacers to keep the inner conductor from touching the shield. Many conventional coaxial cables use braided copper wire forming the shield. This allows the cable to be flexible, but it also means there are gaps in the shield layer, and the inner dimension of the shield varies slightly because the braid cannot be flat. Sometimes the braid is silver-plated. For better shield performance, some cables have a double-layer shield.The shield might be just two braids, but it is more common now to have a thin foil shield covered by a wire braid. Some cables may invest in more than two shield layers, such as "quad-shield", which uses four alternating layers of foil and braid. Other shield designs sacrifice flexibility for better performance; some shields are a solid metal tube. Those cables cannot be bent sharply, as the shield will kink, causing losses in the cable. For high-power radio-frequency transmission up to about 1 GHz, coaxial cable with a solid copper outer conductor is available in sizes of 0.25 inch upward. The outer conductor is rippled like a bellows to permit flexibility and the inner conductor is held in position by a plastic spiral to approximate an air dielectric. Coaxial cables require an internal structure of an insulating (dielectric) material to maintain the spacing between the center conductor and shield. The dielectric losses increase in this order: Ideal dielectric (no loss), vacuum, air, polytetrafluoroethylene (PTFE), polyethylene foam, and solid polyethylene. A low relative permittivity allows for higher-frequency usage. An inhomogeneous dielectric needs to be compensated by a non-circular conductor to avoid current hot-spots. While many cables have a solid dielectric, many others have a foam dielectric that contains as much air or other gas as possible to reduce the losses by allowing the use of a larger diameter center conductor. Foam coax will have about 15% less attenuation but some types of foam dielectric can absorb moisture—especially at its many surfaces — in humid environments, significantly increasing the loss. Supports shaped like stars or spokes are even better but more expensive and very susceptible to moisture infiltration. Still more expensive were the air-spaced coaxials used for some inter-city communications in the mid-20th century. The center conductor was suspended by polyethylene discs every few centimeters. In some low-loss coaxial cables such as the RG-62 type, the inner conductor is supported by a spiral strand of polyethylene, so that an air space exists between most of the conductor and the inside of the jacket. The lower dielectric constant of air allows for a greater inner diameter at the same impedance and a greater outer diameter at the same cutoff frequency, lowering ohmic losses. Inner conductors are sometimes silver-plated to smooth the surface and reduce losses due to skin effect.A rough surface prolongs the path for the current and concentrates the current at peaks and, thus, increases ohmic losses. The insulating jacket can be made from many materials. A common choice is PVC, but some applications may require fire-resistant materials. Outdoor applications may require the jacket resist ultraviolet light, oxidation, rodent damage, or direct burial. Flooded coaxial cables use a water blocking gel to protect the cable from water infiltration through minor cuts in the jacket. For internal chassis connections the insulating jacket may be omitted.